ObamaNation Shrugs: Extremist Signs at Health care Bachmann Rally? Of all the thousands of signs at the Capitol Health care rally the Internet is awash with reports of the 'offensive signs' that people showed up with. Well, to be clear, some report that signs were being handed out - implying the handed out ones may have been those they found offensive. They can only come up with a few signs that they found offensive and use these signs as their reason to condemn people who showed up as wackos. Headlines: The 12 Most Offensive Signs From Bachmann's Tea Party ...spread the twelth. Almost everyone of these search-and-deploy disinformation authors included in their copy-n-paste condemnation write-ups that 9 Bachmann wackos were arrested. This fueled many responses on their websites gleefully attacking the people who came to the Capitol anti-government-controlled-Health-care rally as violent, criminal, and nuts. Pssssst! !...The 9 arrested were pro government controlled health care people. I was also surprised by the amount of Obama people who came out too support the media authors on their comments web pages. Surprised because they have been unusually absent from websites that produce facts they can't refute. This "sign" issue sucked the bama trollers back into life like an engorging tick on a bloodhound. It is repeatedly reported that these health care protest participants are "Republicans". Has anyone polled the crowds yet? It is hard to believe that there aren't Democrats in all these crowds. I recall last year the MILLIONS of Hillary supporters who helped expose Obama's background and the DNC corruption. They didn't just suddenly become couch minions of the party. Don't describe the assembled as peaceful concerned Americans - describe them instead as 'angry' right wing 'Republicans'. Redefine Americans. Redraw the issue. Keep people divided. Agitate the bitter and move the fence sitter. Why would someone be carrying a Maoist sign anyway?? Oh yeah- that's right. Obama's radical Czarina, Anita Dunn's favorite philosopher being -Mao. Mao in the White House. Chavez in the White House. Alinsky in the White House. OH MY! People carrying a sign, or signs, comparing Obama with Marx!! Either you aren't doing your homework or you're a part of the cover up problem. Using Obama's own eloquent words why would anyone think that his vernacular, in many cases, is exact quotes of Karl? Obama's hand picked Czars are Maoists-Marxist-communists-socialists-globalists- anti-capitalists - and they admire dictators and spurn our founding Constitution as needing to be rightfully 'changed' to their personal philosophies. Why would any American question anti-American values in the Obama House? Why would anyone have a sign comparing what is happening in our country, as Obama builds an Americorps army and takes over banks, Car companies, media, Newspapers, Internet, Education, Health care, (etc.) too Hitler's socialist/fascist take over of Germany? Why would you dare protest that? Why would you even think it? Having said that - does one think for a moment that strike busting tactics wouldn't be employed by infiltrating crowds with trained sign carrying agitators? The hypocrisy of this liberal biased media, who scout the crowd looking for offensive signs to try to make a deliberative point that, see, what we have here is a crowd of extremists, is pathetic. 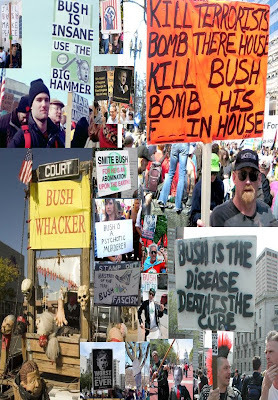 Where were they - their disgust and condemnation- when the signs called for the death of a president? 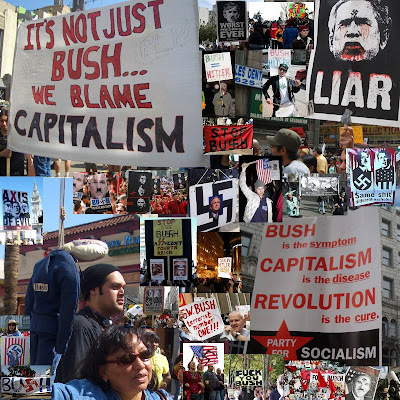 There never were any apologies from Democrats for their people protesting with signs such as these above. Yet they demand Michele Bachmann apologize that someone (not hundreds) - someone- showed up with a sign showing an image comparing Socialist Health care to the Holocaust. Why is there always a double standard with liberals? The outrage directed at a few non-approved signs, that politicians may not even have seen, is not the real issue with these poison keyboard engineers. The issue with these misleading media types is to negatively 'label' people who gather together and minimize context with smearing attacks to obscure the actual issues. Alinsky’s RULE Number 12(13): "Pick the target, freeze it, personalize it, and polarize it." These signs are NOT the issue. The Stimulus Bill has already provided funds and staffed the democratic distributive jury that will decide whether you fit in Obam's 80% bracket. If you can't figure out what That above Obama statement means without reading or understanding a single line of these ration-controlled health manifestos then get ready to go home, shut up, and take your pill. This Health care Bill is a mandated unconstitutional government control of our lives, liberty, choice and privacy. If that resisting imagery somehow makes one an extremist then I'm your huckleberry. Will conservatives please stop calling Obama a Marxist. I'm a Marxist (a true Marxist, not those fake Marxists that Fox News claims are in Acorn and SCIU) and I cannot stand Obama. I don't want the good name of Karl Marx smeared with Obama hideous policies.